Lunar Restaurant is a vegetarian restaurant and is part of the 2-star Lunar Hotel. Their restaurant is more popular than the hotel and has earned a name for itself in North Indian, South Indian and Chinese vegetarian cuisine. The restaurant is located on Gandhi Road right opposite to the taxi stand and the car park. It's in the same building where Dekeling Hotel is located but in a lower floor. There is a narrow staircase from left side of the building that leads to the restaurant upstairs. As you enter, there is a reception counter on the left which is common for both the hotel and the restaurant. Next to that is the large dining space of the restaurant. The restaurant looks overall quite impressive. The floor is wood finished. The tables and chairs are also of quality wood and add to the over all pleasing ambience of the restaurant. There are large glass windows on two sides that open out to excellent views of the mountains. So the window-side tables and particularly the one at the corner and next to the pillar is the most sought after table that has views on both sides. The vegetarian menu is quite extensive. They have a menu that looks like a book with several pages. You will get all sorts of North Indian and Chinese vegetarian dishes including paratha, chapati, rice, mixed veg, paneer (home made cheese) items, Chinese fried rice, chowmein, veg manchurian, baby corn and lot more. They also have several Tandoor dishes. They also offer full range of South Indian dishes including dosas, uttapam, idly, vada and other items. The masala dosa and the paper masala dosas are really great and quite filling. There is a page on the menu that says 'Delicacies', however the items there are surprisingly some of the very common ones like alu raita (curd preparation with potato slices), dahi vada (rice chops in curd), onion salad, plain curd, masala papad (flat bread wafer with spicy toppings), fried papad, and so on. Having said that, the dahi vada is delicious. They also have snack items like paneer & cheese pakodas, sandwiches etc. The restaurant also serves hot and cold beverages including tea, coffee, canned juices, packaged cold drinks etc. Overall the ambience is quite pleasing and the restaurant has an wood finished modern look. It's well maintained and clean. The restaurant being part of a hotel, the waiters have uniforms. You will find mostly Indian families having their meals here. The tables are well spaced out with good elbow rooms. The quality of food is overall quite good but on a little expensive side. Sometimes they put on music which I found to be a little loud. There are wash basins and toilets that are well maintained. The restaurant serves breakfast, lunch and dinner. They accept credit cards. 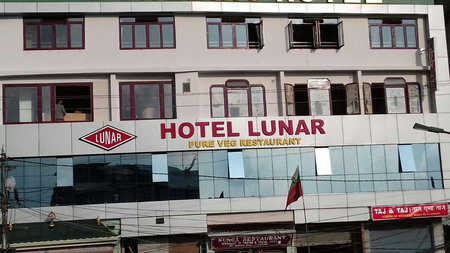 The Lunar restaurant is located on Gandhi road, below the Dekeling Hotel and in the same building. It is right opposite to the taxi stand and the car park on Gandhi Road and in a busy location. Address: 51 Gandhi Road, Darjeeling - 734101, India. 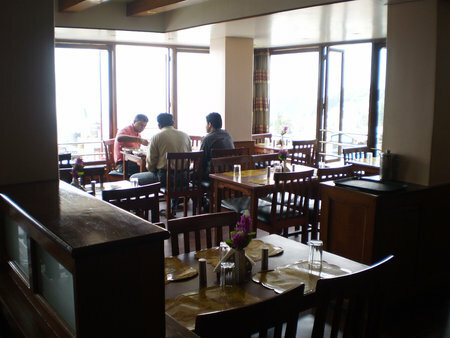 1) Check out Best Darjeeling Restaurants for many other great restaurants in the hill town.